Today Only (10/4), Design by Humans offers the 25% off all collective Tees via coupon code ArtAttack25. Design by Humans offers 20% Off All Design By Humans Tees via code FancyLemonade. Design by Humans offers the buy 2 get 1 free via coupon code FreedomB2G1. Design by Humans offers Free Sitewide Shipping via code 200kLikes. Design by Humans offers 30% off store wide via coupon code DBHfreedom. Free shipping with order over $75. Design by Humans offers 26% OFF on all Design By Humans Graphic Tees via code DBHDealMoon26. Deal ends May 7, 2013. 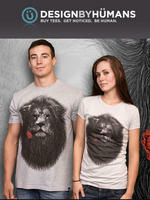 Design by Humans offers 25-55% Off on men's and women's Graphic Tees. Get an extra 10% Off via Code: DBH10.